Salmon & Trout Conservation Scotland (S&TC Scotland) is today leading a call for an immediate moratorium on any new open cage marine salmon farms in Scotland or any expansion of existing sites. Until the current failings in the regulation of the salmon farming industry and the environmental problems the industry causes, as identified by the Scottish Parliament’s Environment Climate Change and Land Reform (ECCLR) Committee, are resolved, there must be an immediate moratorium on any new marine open cage fish farms or any expansion of existing fish farm sites, including any increases in farmed fish biomass at existing sites, as any expansion of the industry now will be unsustainable and may cause irrecoverable damage to the environment. 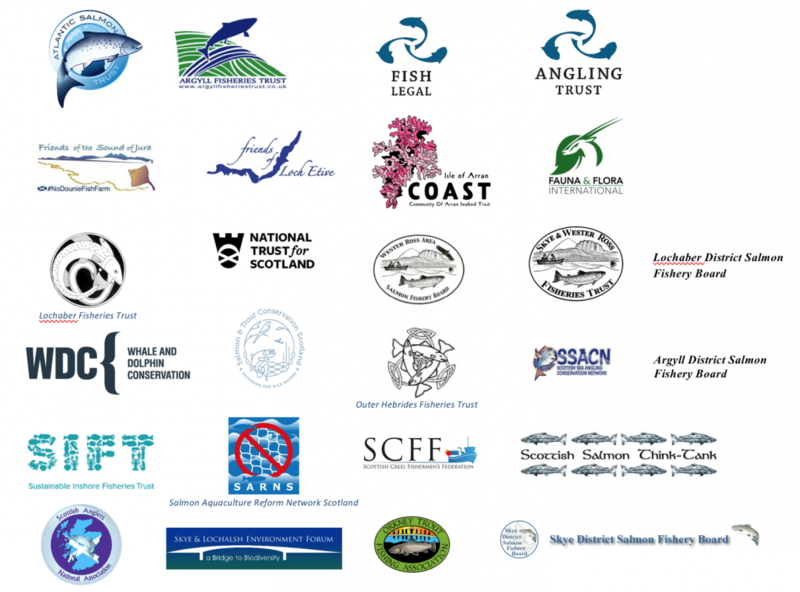 The call for an immediate salmon farming moratorium is supported and endorsed by Angling Trust, Argyll District Salmon Fishery Board, Argyll Fisheries Trust, Atlantic Salmon Trust, Community of Arran Seabed Trust, Fauna & Flora International, Fish Legal, Friends of Loch Etive, Friends of the Sound of Jura, Lochaber District Salmon Fishery Board, Lochaber Fisheries Trust, National Trust for Scotland, Orkney Trout Fishing Association, Outer Hebrides Fisheries Trust, Salmon and Trout Conservation Scotland, Scottish Anglers National Association, Salmon Aquaculture Reform Network Scotland, Save Seil Sound, Scottish Creel Fishermen’s Federation, Scottish Sea Angling Conservation Network, Sustainable Inshore Fisheries Trust, Scottish Salmon Think-Tank, Skye District Salmon Fishery Board, Skye & Lochalsh Environment Forum, Skye & Wester Ross Fisheries Trust, Wester Ross Area Salmon Fishery Board and Whale and Dolphin Conservation. “The all-party ECCLR Committee of the Scottish Parliament unanimously agreed their report in March and concluded that the current consenting and regulatory framework for the salmon farming industry is inadequate to address the environmental issues. They were not convinced the sector is being regulated sufficiently, or regulated sufficiently effectively, and made it clear that this needs to be addressed urgently because further expansion must be on an environmentally sustainable basis. They also said that if the current issues are not addressed this expansion will be unsustainable and may cause irrecoverable damage to the environment, concluding ‘the status quo is not an option’. As it stands, these issues remain completely unresolved and, as the oral evidence given on April 18 to the Rural Economy and Connectivity Committee by SEPA, the Crown Estate, Scottish Natural Heritage and the Highland Council shows, we are a very long way from addressing them”. Last week alone, the Highland Council granted planning permission for two new salmon farms on Skye and the Argyll and Bute Council permitted an increase in biomass of farmed fish on two farms on Loch Fyne, where the record of sea lice control and mortalities on The Scottish Salmon Company farms over the last two production cycles has been amongst the worst in Scotland. “If planning departments don’t believe that the firm conclusions of the ECCLR Committee’s report are sufficient to enable them to refuse such applications and so are carrying on with business as usual, then we need an immediate salmon farming moratorium. If we agree with the MSPs on the ECCLR Committee that further expansion must be sustainable and that, unless current issues are addressed, any expansion will be unsustainable and may cause irrecoverable damage, there can be no other logical conclusion.